The following is two examples of unique problems and working with the customer to come up with a solution. 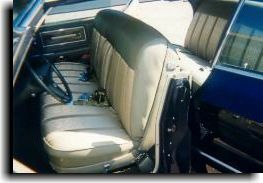 The first example was when this set of seats out of a 1967 Pontiac Gran Prix was brought to Catalina Custom Upholstery to be recovered back to original. There is no after-market vendors replicating the interiors for these automobiles because of popularity. 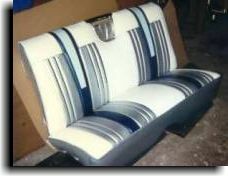 The seats were examined and determined that the stenciled part of the seats done originally at Pontiac was in good condition and it was decided to recondition this part of the seats and use them again to maintain the original design (see arrow in photo of original seat below). Also, the backs of the front back rest (see highlighted area in photo of finished front seat) was used again after a slight modification to work around a damaged part of this area. Using a nice white and silver leather and trimming in a silver vinyl, Catalina Custom was able to provide a product that complimented this customers efforts and enhanced his investment in his classic 1967 Pontiac Gran Prix. 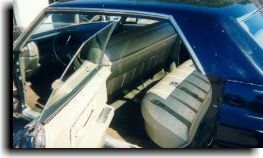 The second example is taken from Mr. Tom Wazalaski's 1968 Cadillac interior. He came to Catalina Custom requesting that the interior be kept as original as possible. The interior was originally beige/gold. When the original cloth and vinyl was located, Mr. Wazalaski had to be informed that the original color was no longer available. A green/gold that was also used in 1968 Cadillac's was available so it was suggested that since the car was black and black being a neutral color, Mr. Wazalaski accepted the plan to change the interior color to match the original green/gold vinyl color and use the matching corresponding cloth. Dash, steering wheel, door panels (because they were molded vinyl), misc. panels and trim pieces all had to have a color change along with new color corresponding seat belts with new original buckles. With research, effort and care this became one of the finest interiors ever produced by Catalina Custom Upholstery. More examples of these and other jobs done by Catalina Custom Upholstery may be viewed in the Showcase Gallery and for further inquiries, please contact us.